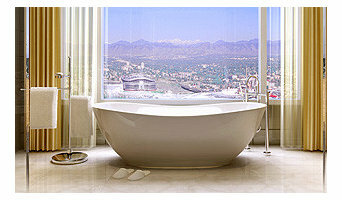 Tyrrell and Laing International, Inc offer Luxury Lifestyle freestanding bathtubs. Our bathtubs are proudly made in the U.S.A. They are IAMPO/UPC approved. Our Bathtubs are available with hot air massage! Please contact us for more information. The Tub Studio was established with a remit to introduce fresh new designs and bathtub ideas. We hope you will agree that there is nothing quite like a Tub Studio package anywhere else in the World. Please enjoy your shopping and if you need any advise, feel free to call one of our team members direct on 1-888-399-0689. We look forward to working with you! The Tile Mural Store is the leading manufacturer of custom Tile Murals for kitchens and bathrooms and a distributor of swimming pool mosaics. With over 3,000 designs from world renowned artists like Christian Reese Lassen, Paul Brent, Jim Hansel, Carey Chen, Sam Park, Sung Kim and Jennifer Garant. Baths of Distinction manufactures many very exclusively designed bathtubs. Made form a proprietary twin skinned acrylic called CoreAcryl, each tub shell is 3/4" thick and incorporates an integrated aluminum sheet insulator within the tub body. All have slip resistant floors and are listed and approved for universal use throughout North America. Baths of Distinction marries the old with the new and for its' 2015 new product launch from sister company, The Tub Studio. Also being introduced is a new line of all bisque colored tubs and new cutting edge design tubs with both a contemporary modern Da Vinci foot and a beautiful Medici vintage foot. Apart from the new all bisque tubs, on offer for 2015 will be many more currently popular colors such as dark and light greys and antique coppers and aged chrome exterior finishes. Also on offer for 2015 will be a new skirted range of tubs with various exclusive finishes. 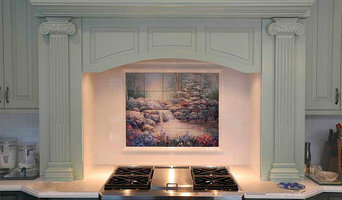 Olde World is a kitchen and bath design firm dedicated to quality craftsmanship and personalized customer service. Founded in 1995 by John & Nancy Braamse, Olde World Cabinetry was formed with their desire to provide quality design and function with quality products and service. Soon after the opening, we launched a plumbing and decorative hardware division, making us a unique destination for any client. Over the years, we have grown into a 4,000 square foot showroom filled with stunning cabinetry displays, plumbing, and decorative hardware. Olde World designers and staff impart their knowledge, professionalism, and years of experience into every project. A precise understanding of the clients’ needs and desires are obtained and transformed into distinctive, timeless, dream-fulfilling environments. 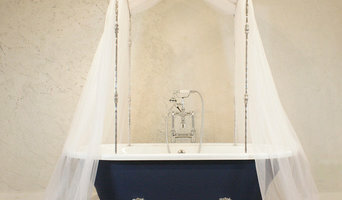 Penhaglion, Inc. Company Info Artisan Crafted Designer Bathtubs A little bit about Penhaglion. The bulk of our manufacturing is done at our facility in St.Petersburg, Florida, USA and while we do import certain parts from overseas, we try as much as possible to produce what we can ourselves. At our facility, we work with many different materials including stainless steel, brass, aluminum, copper, bronze as well as hot rolled steel. We also prepare these metals to offer many different and exciting finishes and patina. All of our bathtubs have four to five layers of powdered enamel applied to the inside shell to meet our minimum stipulated thickness. After the cast iron body of the tub is manufactured and cleaned, it is brought back to red-hot glowing metal. This tub is then placed into an enameling area where a high grade pure white enamel powder is sprinkled onto the inside surface of the tub. After allowing a little time to cure, this process is repeated a further three or four times to meet our thickness and coverage specifications. By the very nature of the application, hand applied powder enameling never leaves a totally flat surface, this is why all cast iron bathtub enamel surfaces can look and be, a little wavy. For our claw feet, we always use traditional heavy cast iron. We design the feet to compliment the tubs we offer. On our skirted tubs, we produce brass, copper, carbon steel, stainless steel and aluminum outer shells. We always ship our skirted and pedestal tubs fully assembled. Our claw foot tubs are shipped with the feet separate, it is a fairly simple task to install these in the home. Silvernail Glass & Mirror Inc.
Full line of heavy glass, framed & frameless shower and tub enclosures. Custom mirror & glass work, decorative glass & table tops. Mirrored walls & mirror removal. Mirrored & glass backsplashes, wardrobe doors and bi-fold doors, glass railings. Family owned & operated 6000 square foot Decorative Plumbing & Elegant Hardware showroom servicing the Tampa Bay area since the 80's. We are a company specialized in the import and distribution of European products for kitchen and bathroom. Servicing the metro Tampa Bay area since 1953, we are a family company providing homeowners with the products they need to create beautiful baths and kitchens. Located in the Tampa Bay area, Pelican Int’l has become one of the most recognized distributors of kitchen and bathroom products in the state of Florida and one of the fastest growing distributors in North America. Our exceptional Quality, Integrity, and service provide our clients a comfort level not often found in the Kitchen and Bath industry. At Pelican Int’l we pride ourselves on customer satisfaction and the professionalism to fulfill our clients needs. Pelican Int’l was created as a family-owned business to ensure the best customer satisfaction. Pelican Int’l is based on three fundamental principles. The first one is to deliver the highest quality product at unprecedented prices. Second, establish and maintain unparalleled customer service. Third, make a commitment to innovation and trend-setting style. Our products include a wide variety of certified stainless steel sinks, elegant porcelain vanity bowls, sophisticated handmade sinks, luxurious granite composite sinks, faucets, granite, marble, quartz, tile and so much more. We have searched and tested many products so we may provide outstanding products at reasonable prices. All of our products go through factory quality inspections, and are inspected a second time before leaving our warehouse. We supply the kitchen and bath industry with pride and joy and enjoy doing it! Hydrologic is one of the largest plumbing and lighting showrooms in the Tampa Bay area. If you are just looking to purchase a new faucet, a light fixture or specify your entire home our showroom consultants can help you. Our 11,000 sq. ft. showroom features a broad selection of products from leading manufactures worldwide. The showroom displays the latest models and technology available to you. With plenty of working displays, vanities, faucets, bathtubs, shower doors, accessories, lighting & toilets you will surely find what you are looking for. Use the Houzz Professionals listings to find Land O' Lakes, FL kitchen and bath accessory vendors. Don’t rule out asking a kitchen manufacturer’s design team for help, too. Skills often can be overlapped to save you time and money! Here are some related professionals and vendors to complement the work of kitchen & bath fixtures: Kitchen & Bath Designers, Kitchen & Bath Remodelers, Interior Designers & Decorators, Cabinets & Cabinetry. Find kitchen and bath fixtures and accessories, plus installation experts, on Houzz. Check out Florida kitchen products and installers, and bath plumbing products and installers, on Houzz. You can also look through project photos provided by Land O' Lakes, FL renovators, retailers and designers.